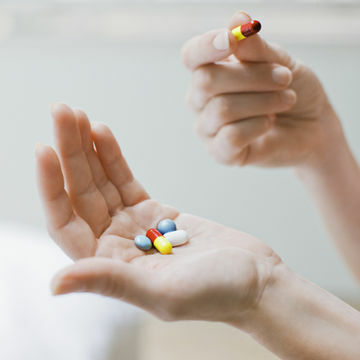 Taking vitamins before conception can cut the rate of this dangerous condition. Lean women who took a multivitamin or prenatal vitamin at least weekly before becoming pregnant and in the first three months of pregnancy reduced their preeclampsia risk by a dramatic 71 percent, according to University of Pittsburgh researchers. No such association was found in women who were overweight before pregnancy. Scientists don't know why heavier women who took the same vitamins remained disposed to the condition. Symptoms of preeclampsia, which affects up to 8 percent of pregnancies, include swelling, sudden weight gain, headaches and vision changes.